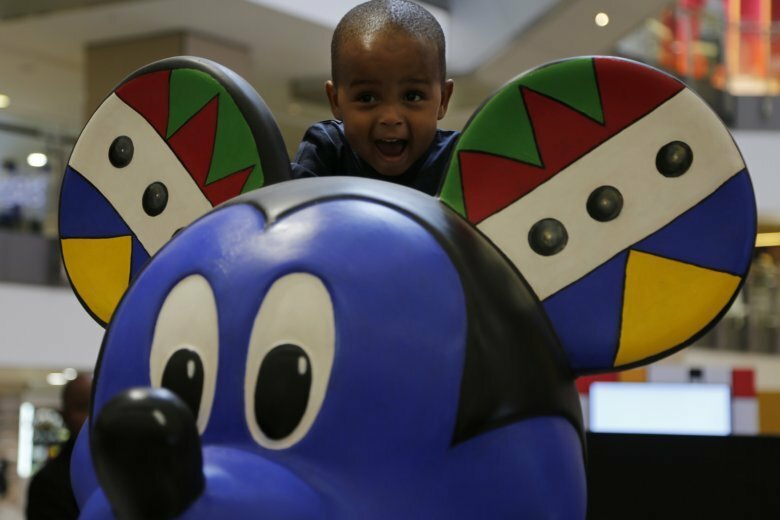 JOHANNESBURG (AP) — Mickey Mouse is getting an African look for his 90th birthday. Ten South African artists each painted and adorned a statue of Disney’s cartoon character, using styles that reflect the continent’s cultural diversity and giving him more wardrobe options than the usual white gloves, red pants and yellow shoes. Mickey Mouse made his debut in the animated film “Steamboat Willie” on Nov. 18, 1928 and centenary events are being held worldwide, according to Disney Africa. He was black and white then, a contrast with the vibrant colors, patterns and imagery bursting from his South African clones. Buthelezi’s Mickey Mouse wears the brightly colored waistcoat and trousers of a ceremonial outfit traditionally worn by Zulu men. Artist Nika Mtwana’s statue has the hat and shoes associated with “pantsula,” a high-energy street dance that evolved in black communities during white rule in South Africa. Artist Cassius Khumalo was inspired by the face masks and body paint of chalk and ochre used in Ethiopia’s Omo Valley. He described the invitation to work on Mickey Mouse as a “gift from the gods” and said Walt Disney was a “genius” for developing a cultural phenomenon of such longevity. The exuberant mice with outstretched arms are on display at a Johannesburg shopping center and will also travel to Durban and Cape Town. The artists worked side-by-side on them for a week at Johannesburg’s Art Eye Gallery and Studio , interacting in a way that some found refreshing in an often solitary line of work. Prominent artists who were inspired by Mickey Mouse over the decades include Diego Rivera and Damien Hirst. Walt Disney and Salvador Dali also collaborated. Novelists E.M. Forster and John Updike wrote essays about Mickey Mouse, a children’s favorite and commercial force for generations. Disney Africa asked the South African artists to stay away from sensitive issues such as politics and religion in their Mickey Mouse imagery, according to several artists. Buthelezi wondered how she might have tackled the project without those limitations. Another artist, Trevor Coleman, said he was drawn to art as a young boy after seeing Disney’s 1940 “Fantasia” movie and, at age 82, is “just a bit younger” than Mickey Mouse. “To me, Mickey Mouse is happiness,” he said.